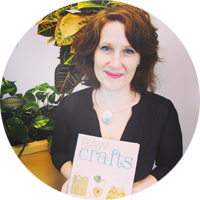 Well I'm developing a reputation and am now getting free craft supplies from friends and family. Last week I got some free fabric, a velvet jacket to take apart and some very funky wallpaper. 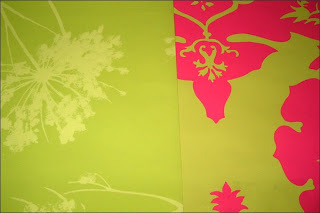 The wallpaper is gorgeous and super fun! I also went to the dump last weekend. I didn't find any furniture but managed to salvage knobs from the wood pile for free. 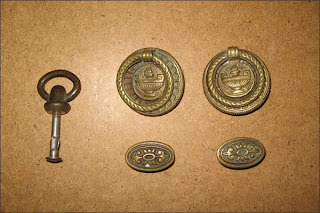 I found these brass knobs (the 2 sets of knobs on the right) on an old radio cabinet that was in disrepair. I also found the other knob (the single knob on the left). Unfortunately there was only one but I'll definitely be able to use it for a project... Now I need some more furniture to refinishs! 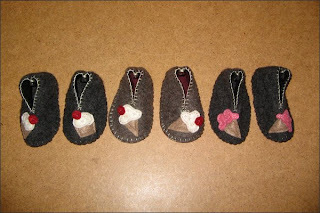 A friend asked me to make her a pair of booties with ice cream cones. I gave her three options to choose from. 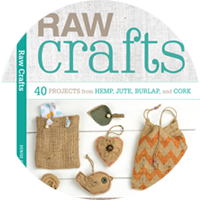 It's fun to share the craft love! I'm going to be working on my white desk again this weekend. 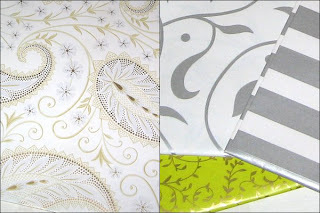 I was thinking about my fabulous gift wrap and wallpaper. I had bought a battery operated clock from the Salvation Army ages ago for $2 that I wanted to revamp. 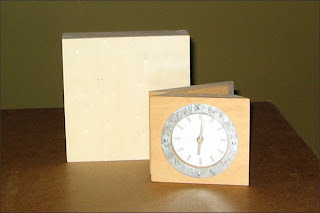 I have a wood panel from Opus Framing and Art Supplies that I want to use for the clock. I think it cost $2-3. I may end up collaging the wood panel with the gift wrap then picking up some silver paint for the sides of the panel. My list of current and upcoming projects is getting out of hand! Later this week I'll post my recent thrift store finds. I got this wonderful wicket basket for $10 from the Lions Gate Hospital Thrift Shop (128 West 15th Street). I'm starting to get more organized with my craft supplies. The wicker basket will definitely help since it's about 4 feet high and 2 feet wide. I also found six pillow forms at the Salvation Army that are in close to new shape. I paid $17 for all six.